A virtual audio space with realtime speech-synthesis navigated by visitors wearing wireless headphones with ultrasound localization system. NoToVo (short for Noise To Voice) is an interactive sound-installation by Annemie Maes (BE), based on the treatment of language as sound. 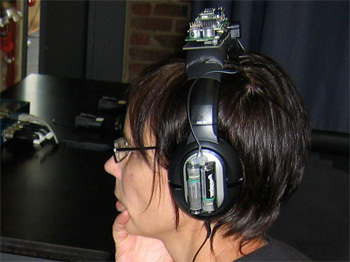 A visitor of the physical but empty installation-space wears a wireless headphone. 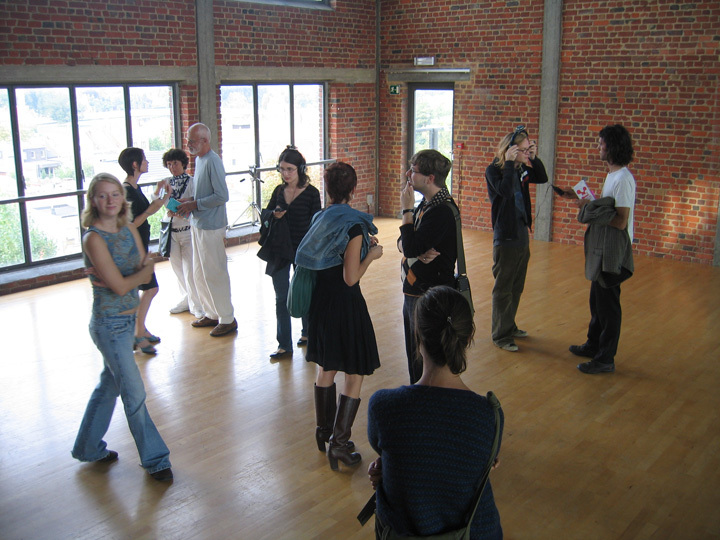 Because the visitors position is being tracked, the visitor can listen to a virtual sound-field with multiple, realtime synthesized vocal sounds, walk though this field and influence the individual vocal sounds in this field. Exhibited at CCNOA, Brussels (BE). Exhibited at Happy New Ears (festival for new music) in Kortrijk (BE). Apple Mac G4 quad computer. Crickets wireless mesh-network (ultrasound and RF) for sending/reciving location-data. 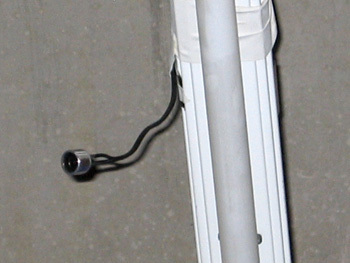 Other sensors (compass, 3D acceleration for tilt compensation). 3 high quality wireless headphones. MaxMBROLA realtime speech synthesizer. Converts phonetic strings of text to vocal sounds using definable parameters as voicetype, phoneme, pitch, timing. MaxMSP for integration of localization data from the Crickets mesh-network, synthesis of the virtual sound-field with binaural spatialisation of multiple sound-sources, speech synthesizer control, realtime phoneme-file manipulation, additional sound-processing and a graphical interface for setting parameters and creating presets. 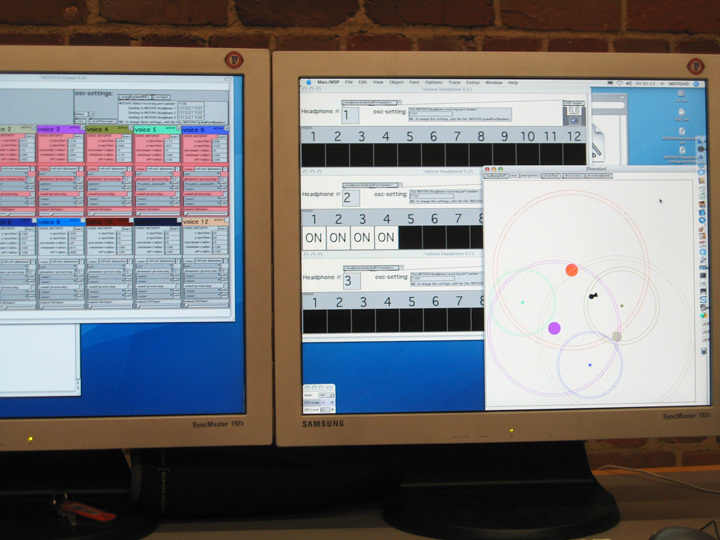 OpenSound Control (OSC) protocol for internal communication between multiple instances of MaxMSP running on the multiple cores of the Mac G4 quad computer. Closeup of heaphone with Cricket electronics. 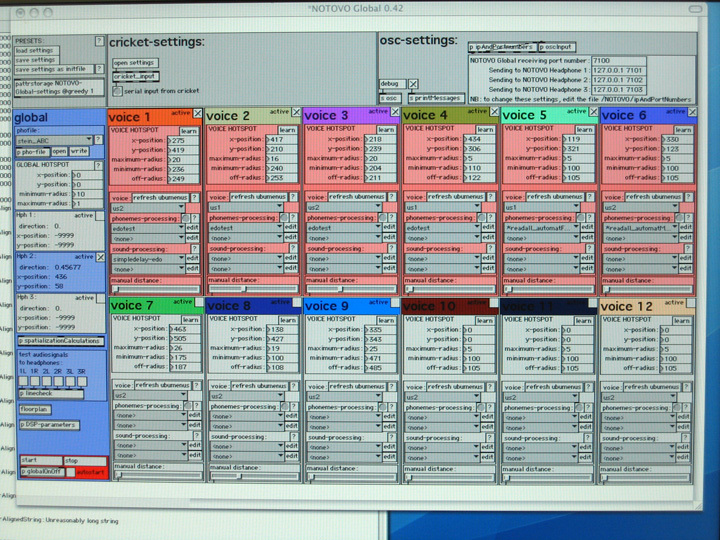 Interface of the custom Max/MSP software. Main interface where a.o. phonemefiles, sound hotspots and phonemes-processing subpatches can be selected and adjusted. 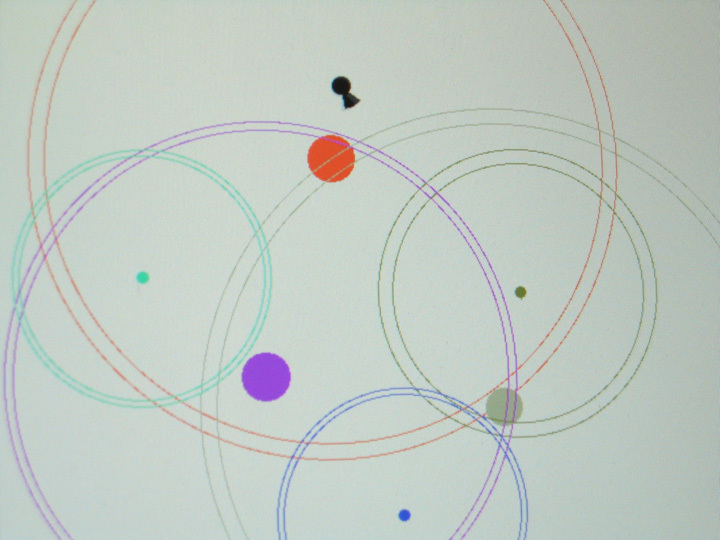 Visual representation of the virtual soundfield, with sound hotspots (colored) and current headphone location (black). 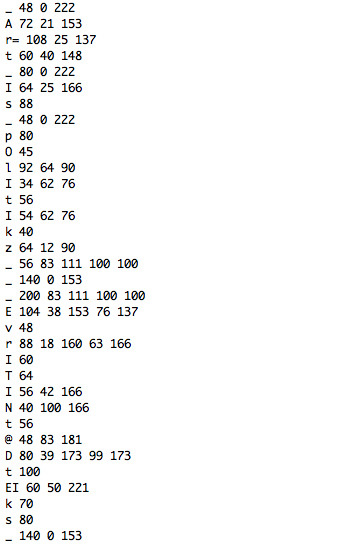 Example of a phoneme file. 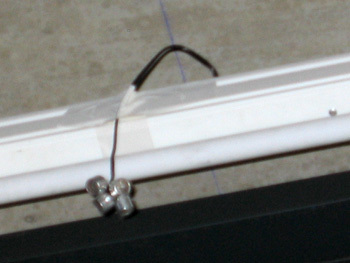 Ultrasound emitters hanging above the physical space. 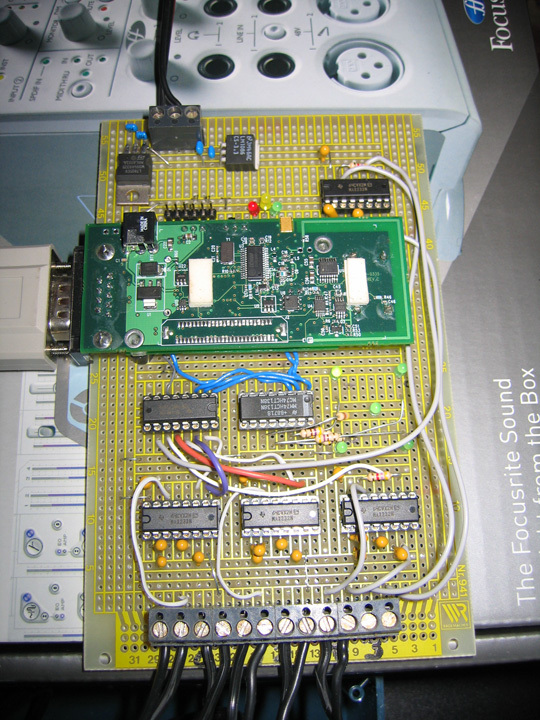 Custom hardware interfacing between Crickets, ultrasound emitters and computer. Developed by Sukandar Kartadinata.